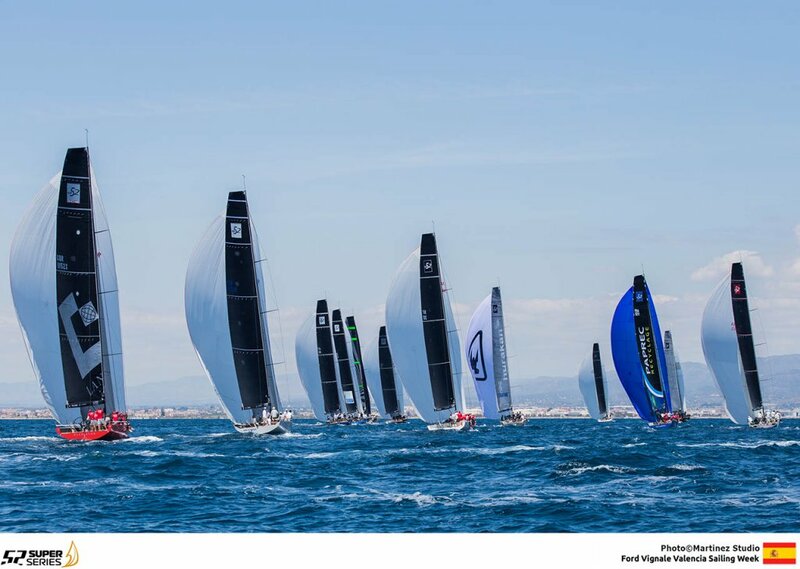 Between yesterday and today see sawing fortunes of the top title contenders at the Ford Vignale Valencia Sailing Week may have been tough to deal with on board the two leading TP52s but they have made for compelling viewing on the waters off Malvarrosa Beach as the 52 SUPER SERIES first event of the season reached its penultimate day. But today, in standard sea breeze conditions and bright sunshine, the Rán crew bounced right back with a strong fourth and first places. Alegre, in turn, had their worst day yet making 17 pts from the two contests. And so Rán’s six points deficit of Thursday night is now a six points advantage which they take into Saturday’s showdown when two races are expected to coclude the regatta. A change of starting strategy was the catalyst for Rán’s recovery. Thursday’s heavy losses were sustained trying to start mid line. But tactician Morgan Larson says today they reverted to working closer to the extreme ends of the start line. A fourth in the first race marked their comeback – even if they were second at one point. And a rocket launch opening in the second start was the foundation for their second race victory of the week. Coincidentally the reliable starting of rivals Alegre seemed to momentarily desert them and Soriano’s crew found themselves deep in the long grass a couple of times, battling back in the traffic too often. In this fleet there can be just a couple of very small things that make the difference between a good day or a bad day. After yesterday we acknowledged that starting up in the middle of the line was not paying and so we took the leeward end in the first race and the windward end in the second race. Both (ends of the line) were strong positions. Best scoring boat of the day was Takashi Okura’s Sled. As tactician and strategist respectively Ross MacDonald and Hamish Pepper set Sled into a strong position near the pin end of the line on the first start of the day, which Mr Okura executed nicel. 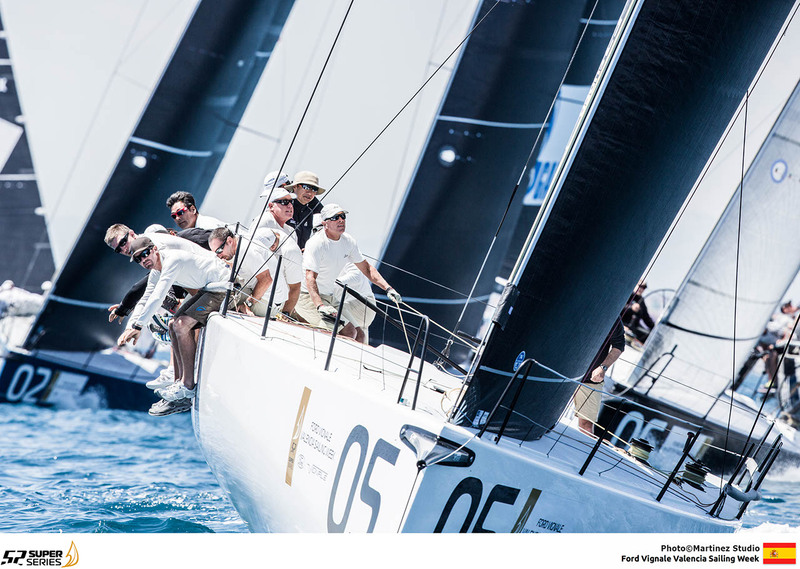 Sled lead around the track with Interlodge second and Quantum Racing third – the second third in a row for the American flagged defending 52 SUPER SERIES champions. We battled today which was tough to do because everyone I think had the same idea which was to keep an eye on the left today. So I think credit is due to Mr Okura for driving the boat well. For us the big difference is Mr Okura, he is quite bold on the line. He is smooth on the helm. We accelerate nicely and that makes a difference. He is a natural sailor. 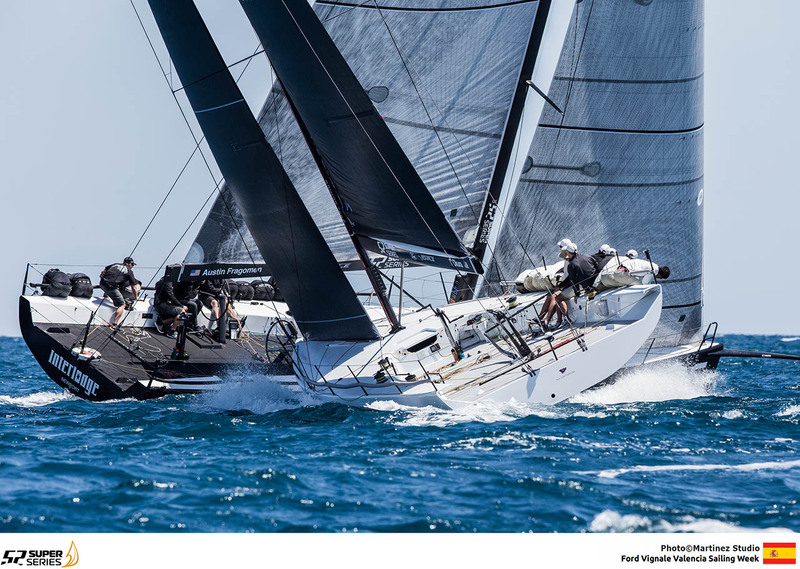 Rán Racing carry that six points lead into Saturday and need a couple of solid races to carry off their first 52 regatta title since they won their TP52 World Championship title in Miami two years ago. In this fleet there can be just a couple of very small things that make the difference between a good day or a bad day. After yesterday we acknowledged that starting up in the middle of the line was not paying and so we took the leeward end in the first race and the windward end in the second race. Both (ends of the line) were strong positions. 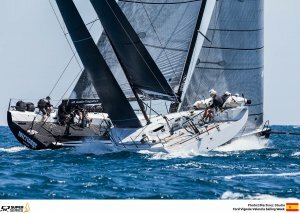 There is something special to this venue when you are starting off the top of the line you get a little lift on starboard and then once you grow a little distance to leeward you can really grow your VMG numbers. We are all learning what is the best speed numbers to sail the boat. And in the leeward position you are able to sail your numbers without being affected by other boats. Those two boats have typically been a couple of boat lengths ahead at the top mark. I believe there is such a small difference between the top three boats and the bottom three boats. I think we go out and sail our best two race and the rest will take care of itself. The fleet is as strong as ever I remeber and it is nice to see there are more than ten boats. They are really fun boats to race when there is a good sized fleet. Hopefully we will gain a couple of more boats. We battled today which was tough to do because everyone I think had the same idea which was to keep an eye on the left today. So I think credit is due to Mr Okura for driving the boat well. We had a great start in the first race and that made it that much easier and even in the second race when we did not have such a great start, it was not terrible but we were a little bit behind but we managed to get right back into it which was good. Everyone is trying to get enough space to be able to put the bow down in the last 30 seconds to accelerate quickly and to be close hauled and on the line when the gune goes. And so all that elbowing is happening in the last minute to create that space and that is where all the communciation takes place, not only between myself and the driver but also with the trimmers, the coordination with the sails really makes a difference. For us the big difference is Mr Okura, he is quite bold on the line. He is smooth on the helm. We accelerate nicely and that makes a difference. He is a natural sailor. I think the wind fills in from that left side. As the day goes on it slowly twists around to the right, but it takes so long to get there that I think the pressure on the left just wins out. The further offshore you are the more left it is, but you kind of have to get out there to get it. At times the right can look quite good until you get finally out to the left and it all kicks in. We are trying hard right now to just make sure we are a contender. We are just looking to be doing everything we can as best as we can. And hopefully as the season rolls on we have a foot in there that we can start to think about finishing on the podium. It is heartening that the set up, the boat, the sails are all working as they should. With everyone more or less having new boats there is always a question mark until you are on the race track.